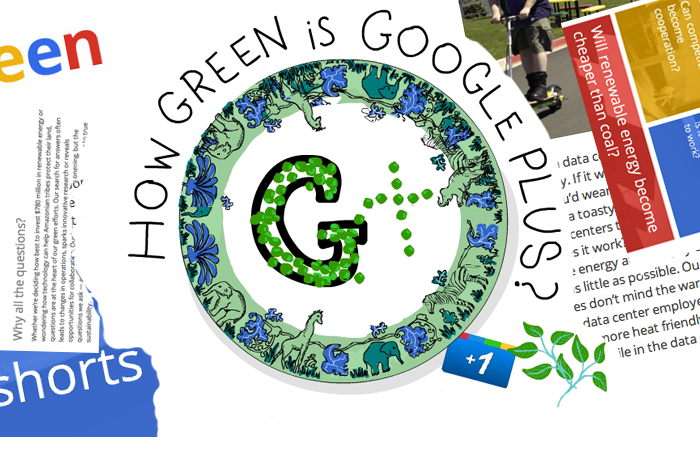 How Green is Google Plus? Google+ is moving fast, and so are some very entrepreneurial folks who are not affiliated with Google. Google has a reputation for being Super Green. So, when I got onto G+, I was hoping I could hang out with Green Googlers and learn tons of stuff about all the cool green things they’re doing. Maybe even soak up some clean green energy tips from Sergey and Larry. And even Eric. But getting my daily dose of greens on G+ required some work by me. My call for green friends was quickly amplified on Twitter. Brad Johnson (@climatebrad) ThinkProgress’s Green Editor at the Center for American Progress quickly retweeted it. Green friends are easy to find on Twitter. I have lists and lists and more lists that tell me who is green, and what is the latest news on all environmental issues. But replicating that deep greenness on Google+ requires some searching. Probably because G+ is still in beta-mode, and there are issues with privacy, Google hasn’t made it easy. To find greens on G+ I entered in search terms like “green” and got pages and pages of results of very green people. But they were green in name only (surname). A few people who are real green leaders came up but not that many. So, I searched for “environment” and found lots of people who are using that as a synonym for workplace. Thanks, but that’s not the ‘environment’ I’m looking for! Planet didn’t turn up much either. The best results were when I searched for the names of eNGO’s and green businesses I follow on Twitter. That’s when I hit the motherlode. Lots and lots of green people from eNGO’s and green businesses are on Google+, like WWF, 350.org, Grist, Mother Jones, Greenpeace, David Suzuki Foundation, Fresh Energy, Think Progress and more. So, how green is Google Plus? That depends totally on you. Even though Google is green by reputation, Google Plus is color-blind. G+ is all about making your experience as individual as you are. What color will your G+ be? You can make it whatever color in the rainbow you want. Are you wondering who I have in my green+ circle? Well, if you share my passion for all things green and sustainable — and want to discuss the latest environmental news — I’d love to bring you into my circle. Please join me on Google+. You can find me by searching for “Franke James” (artist and author). I’m happy that I have a Green Circle on Google Plus now and that it’s attracting green thinkers, leaders, movers and shakers. Join me, so we can make the most important circle, Our Planet, Greener together. Its great to read about people with environmental careness such as yourself. 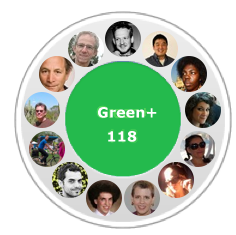 Wish that everyone would join your green circle. I’ll sure do! Thanks for the Green info! I’m headed to links right now so I can plug into the Green Scene!